The Amalfi Coast has some of the richest culture and history in all of Italy. A great advantage for staying at the Hotel Onda Verde is that we have an exclusive birds-eye view of the Amalfi Coast. 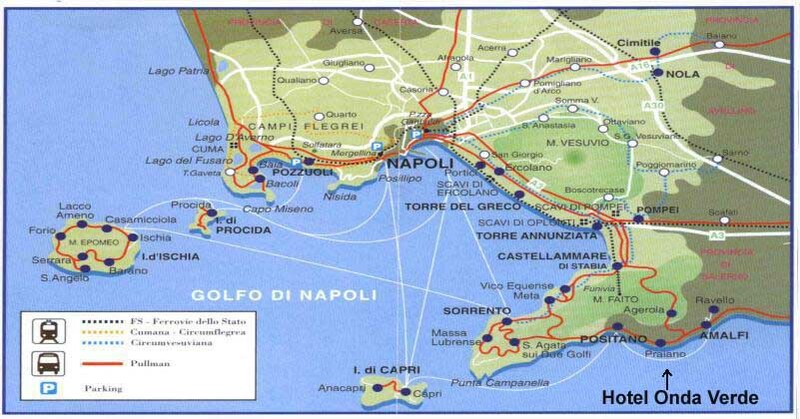 The views include the Saracen Tower of Praiano, the Conca Promontory, the Paestum, Capri and the Point of Campanella. From the hotel, there is a short path just below the hotel (30 meters) leading you to the beach facilities. The hotel Onda Verde is situated in the center of many interesting places. 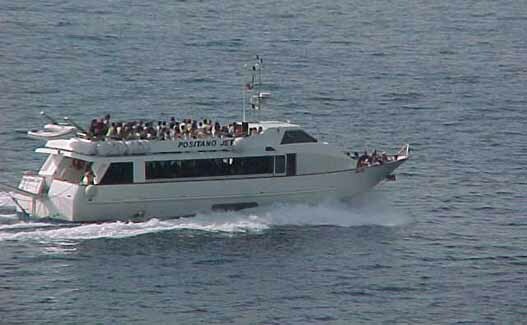 In the beach area, there is a landing-stage for boats to Positano and daily excursions to Capri. Another advantage for staying with us is that we are well connected to the most interesting places in the Amalfi Coast. We offer a variety of possible daily excursions followed by peace and a quiet place of rest for you when you come back to your home at the Onda Verde. The local bus called SITA with a bus stop on our parking level takes you to the center of Amalfi, Positano, Ravello, Sorrento, Pompeii and many other places on the Amalfi-Sorrento Coast. For excursions to Pompeii, Herculaneum and Naples, there is public transportation called the "SITA" bus to Sorrento. From there, a local train called the "Circumvesuviana" can take you onto your destination. At any time, if you prefer, we can organize a private car to take you anywhere you wish to go. For those who prefer English organized excursion guided tours to Capri/Anacapri, Pompeii & Vesuvius, Herculaneum & Sorrento, Naples, Paestum and Rome there are local travel agencies with guides available. We will help you with organizing their professional services to your satisfaction. Distances in Km between Praiano and excursion locations..